A Thai seasoned sausage is one which I’ve had in mind for a while. Cheryl and I both enjoy Thai food and when it comes to picking the meat for our take out order I usually go with pork. I know, big surprise. One evening I had a eureka moment when it dawned on me Thai seasonings work well with pork so why not incorporate them into a sausage? Idea hatched. Since this was a new sausage using flavors I don’t normally cook with (do you see any Thai dishes on this blog?) I needed to do some old fashioned recipe testing. One day while I was picking up some other seasonings at our favorite local spice shop, Savory Spice in Lincoln Square, I browsed their selection of Thai seasonings. They have a pretty good selection of curry powders and I settled on their green curry one as well a small jar of Makrut lime powder. With these in hand I set to work and mixed up a couple of different test batches with other various ingredients. The sausage turned out well, good curry flavor, some lime, and just enough smoldering heat. So what to do with it? In my mind there was only way to really serve this sausage: as a banh mi. Yes, I know I’m using Thai flavors and putting them into a Vietnamese sandwich. 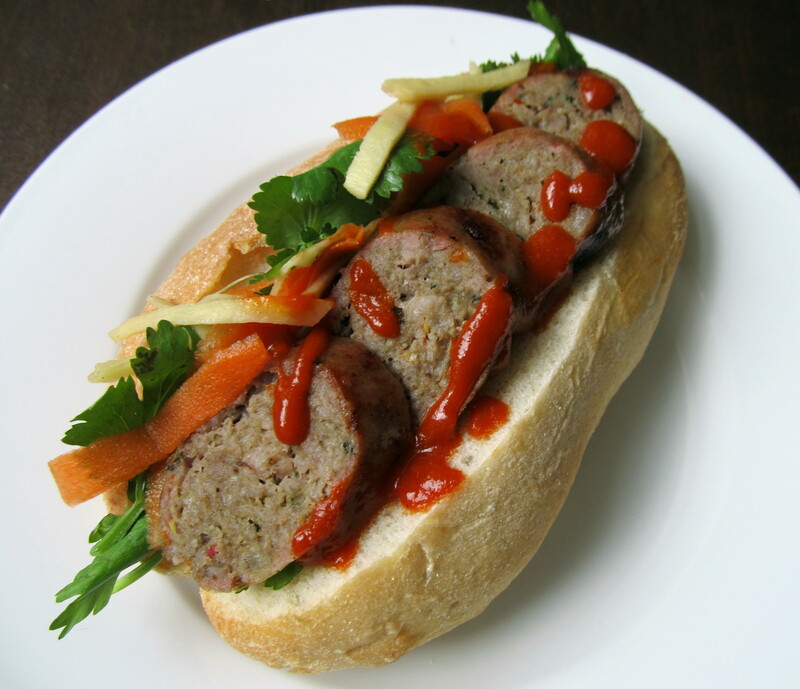 But the banh mi flavors are the perfect balance for the spice of the sausage. Fresh cilantro, pickled ginger and pickled carrots, with just a dash of sriracha in case you wanted more heat. You can even put some jalapenos on top if you really want to punish yourself (I did the other night and paid for it dearly). This combination is absolutely a case of the whole being more delicious than the sum of its parts. The heat of the sausage will be totally dependent on the curry powder you use. Make sure you get a good one! As for the pickled vegetables, you can add pretty much whatever vegetables you like to the recipe below. Cucumbers and radishes would be excellent additions to the carrots and ginger. Combine and mix the diced pork, fat, and spices. Chill until ready to grind or set in refrigerator and chill overnight. Run water through the casings and let soak in a small bowl of water for 30 minutes or until you’re ready to stuff them. Using the medium holed grind plate, grind the seasoned pork and fat into a mixing bowl set in ice. When done grinding all of the meat, add the water and mix until it is absorbed and the pork gets “sticky.” If using a stand mixer it will take about 1 minute with the paddle attachment. Make a small patty and cook to check the seasonings. Twist the sausage into 5-6 inch links. Peel the ginger and cut into fine julienne. Wash the carrots and with a peeler cut into ribbons. Combine the water, vinegar, sugar and salt (and a tsp of pickling spice if you want) in a saucepan and bring to a boil on the stove. Boil for 5 minutes. Place the ginger and carrot in a small jar and pour the pickling liquid over them. Make sure the slices are covered with liquid. Allow liquid to cool, then cover and refrigerate for at least an hour. As always, the longer the better. If you make it in the morning it will be ready for use at dinner time. I have no issue with that. Only the snobby traditionalists feel like one shouldn’t alter “authentic” recipes. But I think any dish can be made Thai, Indian, Southwestern, etc. That’s the fun in cooking! My hats off to this fabulous looking sausage and bahn mi!!! Thank you! Yes, it’s definitely ‘fusion’ cooking! I don’t even think, personally, that it’s fusion, because you’re not really mixing two strongly defined cuisines, but merely creating a cuisine-inspired dish by using the proprietary ingredients of that cuisine. I mean, you can make mashed potatoes Thai, or Mexican, or Mediteranean, or Indian… Maybe I’m just so partial to it because that’s what I love to do in the kitchen. It’s fun!! !